Mort Kunstler Handsigned and Numbered Limited Edition Giclee on Canvas:"Gentlemen, You Must Pardon Me"
About the Art: One final trial remained in the Winter of 1782-83, Washington's army was wracked by hardship and unrest as the American economy neared collapse. Money had almost entirely lost its value. Soldiers received news from home that their farms and businesses were failing, and that their wives and children faced the specter of poverty and starvation. Their only hope was that Congress would follow through on its earlier promise to provide veterans and their families with substantial pensions and back pay. But this Congress now refused to do so. The government was out of money, and the states refused to supply the funds necessary to run the country, let alone to support veterans. Enraged, many soldiers and officers spoke of marching on Congress and enforcing their will on the nation at the points of bayonets. A manifesto spread through camp attacking "a country that tramples upon your rights, disdains your cries and insults your distresses," and called on Washington to spearhead a military rebellion. On the brink of total victory, democracy in America hung by a thread. This was Washington's hour. No other man in America possessed the power to step into the gap that yawned between soldiers and civilians and pull the country back together. Had he sought personal power, Washington might easily have joined with his soldiers and taken over the country. Instead, on March 15 he appeared before his officers, assembled in a large wooden building at Newburgh, New York. His bearing was grave but firm. 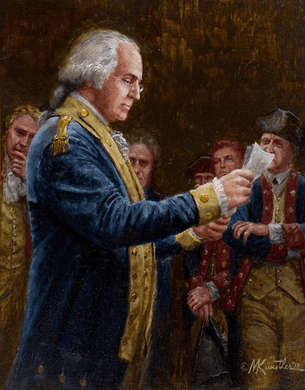 In a stirring speech, he begged the officers to convince their men to desist from talk of rebellion, and to trust him and Congress to do their duty. In doing so, he said, "You will give one more distinguished proof of unexampled patriotism & patient virtue, rising superior to the pressure of the most complicated sufferings; And you will, by the dignity of your Conduct, afford occasion for Posterity to say, when speaking of the glorious example you have exhibited to mankind, 'had this day been wanting, the World had never seen the last stage of perfection to which human nature is capable of attaining.'" His speech completed, Washington paused. He glanced at his audience, which remained silent, and pulled out a letter - unfortunately rather dull - describing Congress's troubles in raising money. Before starting to read, Washington paused again, reached in his coat pocket, and pulled out a pair of spectacles. He had never worn them in public. By way of explanation, he gazed at his officers and said, "Gentlemen, you must pardon me. I have grown gray in your service and now find myself growing blind." It is unlikely that any of the officers heard a word that followed as he read the letter, but their eyes were cloudy with tears. Washington strode out of the room, and the officers voted unanimously to abandon all talk of rebellion and profess total obedience to Congress. With a simple gesture, Washington had saved democracy in America.